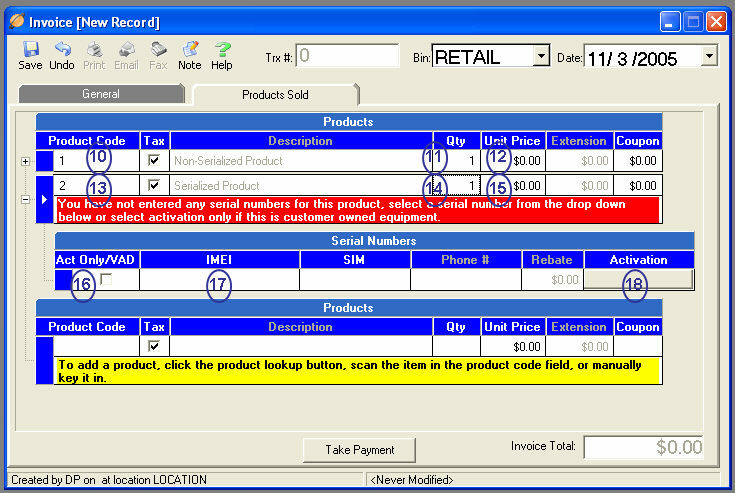 (10) Enter the Product Code into the Product Code field by scanning the product barcode with a handheld barcode scanner. You may also type the product SKU into the product code field or perform a lookup for the product by clicking the grey box on the right-side of the product code field. TeleTracker Online will automatically populate the product’s corresponding information as defined in the Product Master File. (11) Enter the Qty (quantity) of the product being sold. TeleTracker Online will automatically default the quantity field to one (1). However, you may change the quantity by either using the scrollbar on the right hand side of the Qty field or typing your desired quantity in the Qty field. (12) Assign the appropriate Unit Price to the product. If the product master file is configured with a default unit price, the unit price field will automatically populate. Depending on your user security level, you may or may not be able to modify the unit price. If you desire to change the unit price, click into the unit price field and enter the appropriate amount. (13) Enter the Product Code into the Product Code field by scanning the product barcode with a handheld barcode scanner. You may also type the product SKU into the product code field or perform a lookup for the product by clicking the grey box on the right-side of the product code field. TeleTracker Online will automatically populate the product’s corresponding information as defined in the Product Master File. (14) Enter the Qty (quantity) of the product being sold. TeleTracker Online will automatically default the quantity field to one (1). However, you may change the quantity by either using the scrollbar on the right hand side of the Qty field or typing your desired quantity in the Qty field. (15) Assign the appropriate Unit Price to the product. If the product master file is configured with a default unit price, the unit price field will automatically populate. Depending on your user security level, you may or may not be able to modify the unit price. If you desire to change the unit price, click into the unit price field and enter the appropriate amount. (16) Place a checkmark in the Act Only/VAD when activating customer owned equipment. (17) Select the appropriate Serial Number. If a serial number has not been entered you will see the following message: “You have not entered any serial numbers for this product...” In order to complete and save the invoice, a serial number must be select for each serialized product. Enter the product’s serial number by scanning the serial number barcode with a handheld scanner into the ESN or IMEI serial number field. If activating a phone, in most cases the serial number will be the ESN or IMEI number. To perform a lookup and choose from available serial numbers, click anywhere within the ESN or IMEI serial number field. Click the drop-down arrow to the right of the field and select the appropriate serial number.